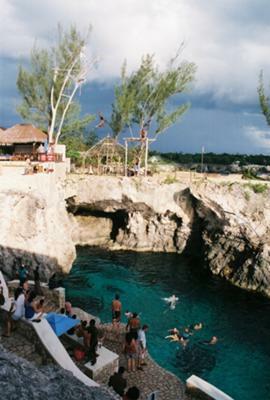 In May 2010, my two wonderful daughters took me on a trip of a lifetime to Negril, Jamaica! This was my Christmas present from them both and they wanted to take me somewhere as I had always wished to go. Knowing how much I love the ocean, this was an awesome trip! I had just closed on my house on Friday and boarded a plane to Mobay on Saturday. I had jumped through so many hoops about the house I hadn't gotten a chance to get excited about my trip. Landing in Mobay was awesome. We followed the tourist like cattle to customs and then to our taxi bound for "The Grand Pineapple Resort". A beautiful, colorful resort that is totally awesome. Anyway, we saw the most beautiful countryside and the people along the road took my heart. I was taken back by it all and truly sad to see this poverty. We arrived at the Pineapple and never touched our luggage except to pack and unpack. I saw my daughters at breakfast lunch and dinner and an occasional party on the beach. We had big plans to see this and see that, but I found myself sitting in a beach chair at the waters edge that our dear sweet security guard "Ralston" had reserved and prepared for us everyday we were there. I just sat and watched the hustlers on the beach. Never afraid to venture off the property. The guard always knew who we all were and to get our room numbers if we left so in case we did not return, they would search for us. dancing, crafts, hair braids, you name it. One particular guy who entertained us was "Gilbert". He danced from one end of the "7 mile beach" to the other. He gave the guards a run for their money. It was comical at times I have to admit. You can watch Gilbert on U-Tube. We met a huge group of people from Chicago who were a blast. The adopted us and we went everywhere with them. We exchanged e-mails and addresses. We will visit each other soon I know. We met the coolest couple from Germany. Totally wild. We always went off the property. The "real" Jamaica lies there. I have fallen in love with Jamaica. I tell my friends that I was adopted by a white family in the States and that I am really Jamaican. I have met some of the most wonderful people on this website and now when I return to Jamaica, I visit with people whom I have met that live there. I have become very close with some. I have traveled to Jamaica going on my fourth time since May. Customs is starting to question me-haha. I have thought about visiting other places, but unless my Jamaican friend wants to go with me, I'll just vacation right in JA. I was told to watch "How Stella Got Her Groove Back" when I returned from JA in May, well, some might say I now have a Winston-lol. I believe that Jamaica is GOD's home. The beauty and people there are spectacular. america is supposed to be a one of the richest country on the world, my house was broken into three times , i have witness robbery taking place. subured or city most homes have burglar alarm.what is difference, one beg the other break in,crime is all over the wold,we go to other country and see the same thing that is happening in our own,call their ,crime and shove ours under the rug, so look in your house before talk about others,next why are you trying to take the fun away? During my many travels to Jamaica this past year, I have discovered that all the Jamaicans I met along the way turned out to want only one thing, my money. They are all looking for the "Dream". Atleast the Jamaicans I met were, not to say they are all like this. My biggest threat was the security at the Resort I stayed at the first time. I thought he had become a long time friend but he was the one stealing from me the whole time. All Jamaican men think your beautiful, they are in love with you and they want to marry you. Please don't fall into the trap. This is most of their nature and you will be extremely hurt in the end. My friend from the States was also robbed of her money. They can cash your travelers checks if stolen. Everyone there has a connection some how. This has been a very expensive and heart wrenching experience for me. I am shocked to think that people can live with themselves after doing this to tourists. My inncodent I am sure is not isolated. This happens all the time. Just always have your eyes open, your wallets always with you and your hearts tucked way down inside your body. It's too easy to get caught up in their world.